When traveling, cuisines are one of the many things I do not wanna miss to try. Since Philippines is an archipelago, one of the many regional differences are the cuisine from the different parts of the country. So when we arrived early in Zamboanga City or Ciudad de Zamboanga, in its local tongue of Zamboangueño Chavacano, last March, our new found friends, Chucky, Carol and Almin, who were kind enough to meet us at the airport immediately suggested for us to try their popular breakfast meal to locals known as satti. I heard about the place from the previous friends I have known who have visited the place. And since then, I have long been eager to try out this new cuisine that has not only gained popularity in the Southern Philippines but all over the country. We went to Pilar Street where the famous Jimmy's Satti Haus is located. Some say that this satti comes from Malay influence, while others say it is from Indian. Well the thing for sure here is that satti originated from Sulu and can be found mostly in Southern Philippines. 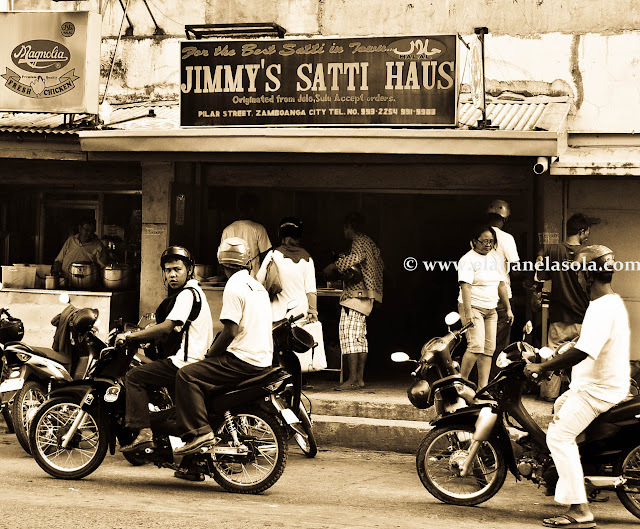 Other places where you can find one aside from Sulu, is in Zamboanga and Basilan. To go to Zamboanga, you can book connecting flights from Manila. Aside from the skewers, they also have chicken barbecue! Satti's taste for me is quite new to me; it basically is made of marinated chicken and beef skewers which are dipped with hot, thick, sweet and spicy sauce. Its sauce is a fine mixture of fresh tomatoes, soy sauce, peanuts and hot/spicy flavors which is thickened with corn starch. 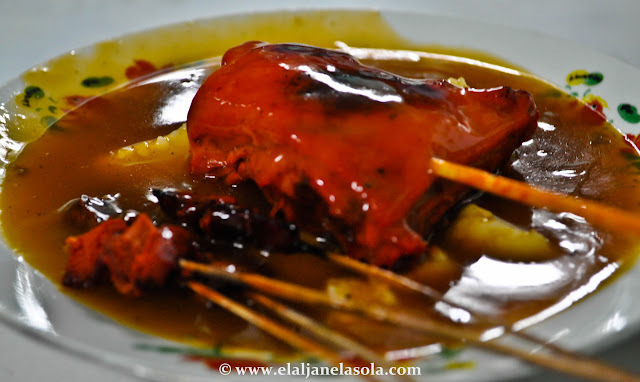 This delicious cuisine is perfect with puso (popular sticky rice cooked while wrapped in coconut leaves which originated from Cebu) or hanging rice. Satti skewers costs 5 pesos per stick and puso rice from 8 to 10 pesos. Our first gastronomic experience in Asia's Latin City was indeed satisfying! But it didn’t end there, of course. We also had “Curacha” and “Knickerbocker”, two of many that we can add to the list of new and mouth-watering experience in the city. great you enjoy this food Elal. @Pinoy Adventurista: Agree. I miss eating satti too! @Doc Wends: Awww. That was too bad Doc Wends. Sayang!